You would be forgiven for thinking this isn't the first time you've seen a Mizuno JPX Fli-Hi. In 2011, Mizuno released the previous JPX Fli-Hi on the back of even older MP and MX Fli-Hi designs. Now for the 2014 season, Mizuno has redesigned the long iron replacement to offer "an effortless launch and steep landing angles." The distinctive face-forward profile of the JPX Fli-Hi is designed to allow the leading edge of the club to glide under the ball, enhancing contact with the ball and creating an easier ball flight. "These aren't standard hybrids - these are Fli-Hi's." said Bill Price, Mizuno's Custom Fitting Manager. "They're not designed to hit the ball 250 yards... they're a very specific tool to hit the right distance for the exact iron they replace. The difference with the Fl-Hi is that you'll effortlessly hit the same distance more often." The drop down crown shape, shown above, helps move the centre of gravity deeper and lower in the new Fli-Ho to produce a high launching shot that lands on a steep, controlled angle. The CORTECH face features Mizuno's Hot Metal, which uses a multi thickness design to produce faster ball speeds. Add that to the steel body of the Fli-Hi and you have a long iron replacement that will be easier to hit, higher launch and able to stop near the flag. Most golfers will use a utility club or long iron replacement from either the fairway or the rough. 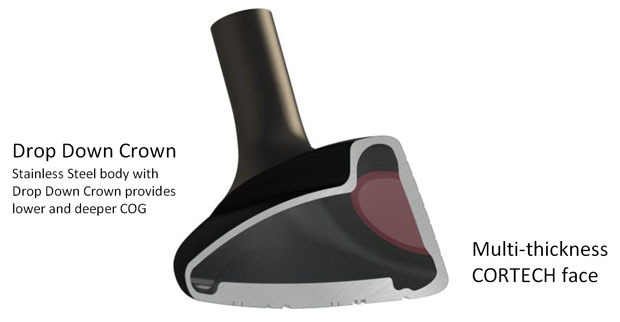 The newly designed Speed Bevel Sole has been designed to aid these shots, creating maximum head speed by reducing the turf drag at impact. With five different loft options, the JPX Fl-Hi is designed to fit into a traditional iron set, and distances are engineered to match a solid strike with the long iron it replaces.